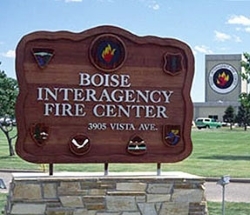 Boise Interagency Fire Center entrance sign. Courtesy of National Interagency Fire Center. 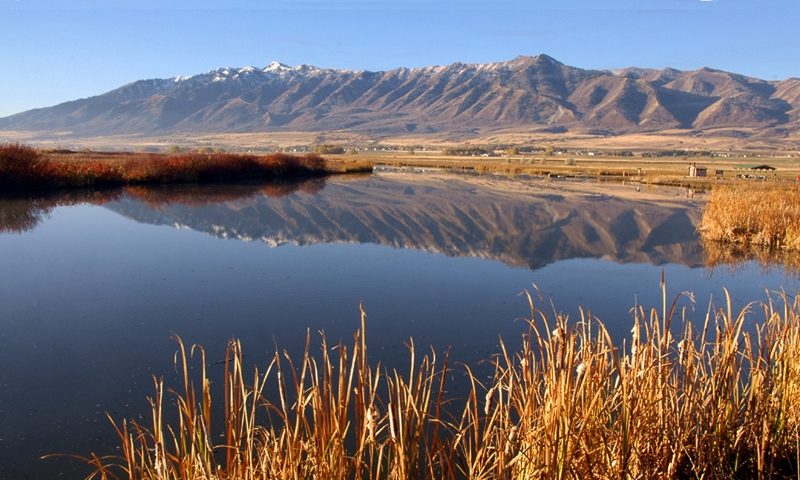 The haze above Cache Valley begins to dissipate after weeks of hovering low and thick like a winter inversion, even as the Goring and Hansel Point Fires rage on just west of the Wellsville Mountains that bookend the valley. Both blazes, just two of the more than ten active fires in the state, are still less than 50% contained. Farmers and ranchers in Box Elder County are now doubling as volunteer fire crews. To date, the National Interagency Fire Center has reported over 5.1 million acres burned in nearly 39,000 individual fires throughout the Western US and small pockets farther east. According to the agency’s website, “more than 28,000 firefighters and support personnel are [currently] working on 100 large fires that have burned 1.6 million acres.” And so goes another fire season. Night view of burning pine trees and power pole. Courtesy of National Interagency Fire Center. It’s a hard thing to play spectator to—these yearly displays of destruction. It’s an even harder thing to draw a silver lining around, considering the potential for loss of land, property, and sometimes even life that each new fire season brings; but that’s what I’ll try to do here. As part of a recent Utah Master Naturalist course in which I participated with USU’s Extension Office, I was reminded of the extreme import of fire here in the West. Ecological processes are complex and dynamic; and, here in the West, fire is a critical piece to that constantly morphing puzzle. Let’s consider a mature forest, for instance. 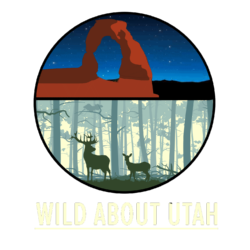 Here in Utah, one might consist of large, shade tolerant spruce and fir groves. Free of any human intervention, these groves would occasionally succumb to wildfires which would act as cleaning crew for the collection of understory growth and dead plant material that litters the forest floor. 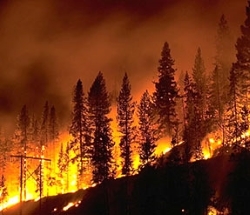 Such phenomena accomplish two tasks: one, frequent fires reboot the process of ecological succession wherein grasses, shrubs, and early succession species such as aspen trees and lodgepole pines take up the yolk of repopulating the forest; this leads to the second achievement of regular, unsuppressed wildfires—forest health. A dynamic, changing forest full of actively diversifying plant species are less susceptible to pests and disease. Wildfires mean forest longevity. Moreover, frequent fires limit understory fuels and produce low-intensity burns that are less likely to completely destroy a forest. In the late 19th/early 20th century, though, this was a hard pill to swallow, and understandably so. Fire, as I said earlier, can be a threat to land, property, and life. Thus, we inherited a policy of fire suppression throughout the Western United States which, though it may sound fruitful, has accomplished quite the opposite of our intentions. Fire suppression allows understory ladder fuels to accumulate in quantities that, when finally ignite, produce high-intensity blazes that are consummate in both their size and scope; they burn quickly and exhaustively. This presents problems on its own, but climate change also promises to lengthen our fire season by as many as three months in some areas of the West. So what does that mean for those of us who make our home in the Western states? Well, first we must remind ourselves each season that fire is indeed part of the ecology of the place we call home, and with that in mind take steps to insulate ourselves from its most dangerous characteristics. This includes creating and respecting buffer zones between human settlements and forests that are particularly susceptible to wildfires. Californians know this all too well by now. Additionally, responsible behavior when playing in or travelling through the Western wildlands goes a long way to preventing wildfires. Being aware of fire bans and mediation efforts is the best way to meet Smokey’s expectations.